manual. If something is not original, it will be clearly stated in the ad. Prices are subject to negotiation and trading. 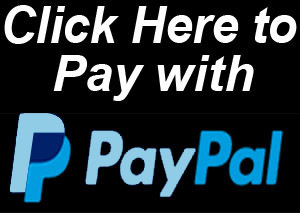 For these items, only Paypal, Western Union, and credit cards will be accepted for foreign buyers. A friend of mine made some great spade grips for the MG42. Video is shown below. If you're interested in a set, contact Charlie at TAURUS3L6@yahoo.com - He's a gun dealer/C3 SOT in Avon, OH. Price: $475 + $18 shipping. 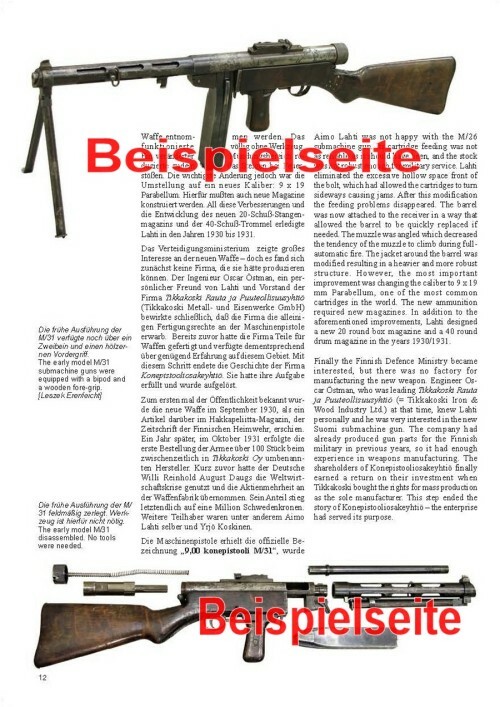 If you think this is expensive, here's a link to an original set in Austria, which sold for $801.00 US. Video - Large file - works best if you right click and do a Save As to your desktop, then play it from there. One set of 3 volumes, in excellent clean condition. $225, includes US media mail postage and insurance. Foreign sales are OK, but postage will be higher. Pictures are available on request if necessary. If you have watched prices on this set, you know this is a good deal. have tool to keep from scratching the chamber when trying to remove a ruptured shell. A standard issued tool for the tool pouch. SOLD, I DO NOT HAVE ANOTHER, $150 plus postage. Foreign orders are welcome, registered mail or insurance is required. The rusty look in the pictures is the old grease, which has since been soaked clean. I can provide pictures of the exact tool you will receive if requested, but they're all the same.. I have one MG42 recoil booster soaking jar (steel). These are a lot harder to find than they used to be. B+ condition with good blue, some blue wear on the lid. 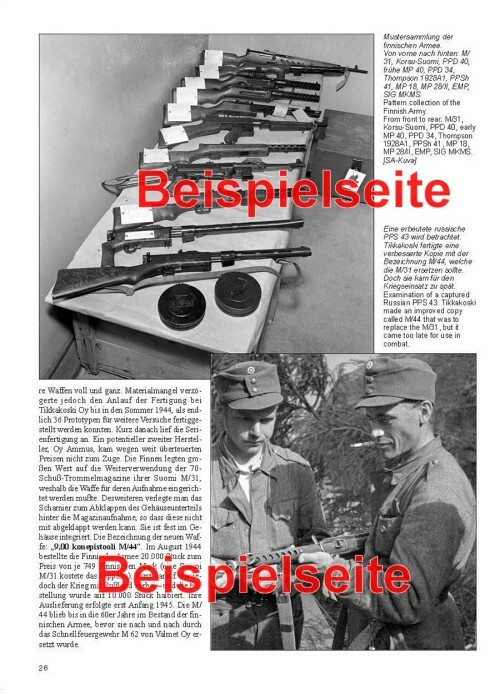 Clear waffenamt on the side. Clearly marked on the lid: "Petr.-Büsche f. Rückstoßverst. z. M.G.42 ddf"
$225 + $7 priority mail postage. I have ONE in B+ condition. Ask for pictures if you need to. I don't post them because I buy and sell, and I don't want to accidently leave an old picture on here and mislead anyone. 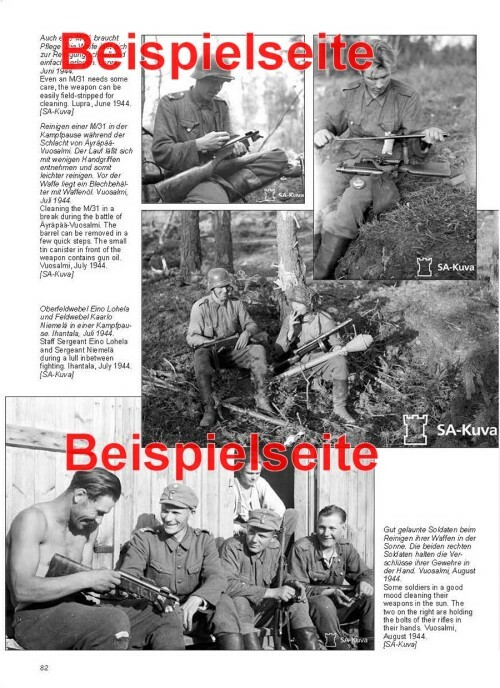 The Norwegian MG34/42 lafette wrench functions identically to the German WWII version, except it has a part number stamped on one side and no waffenamt. German wrenches in good condition sell for $200+. 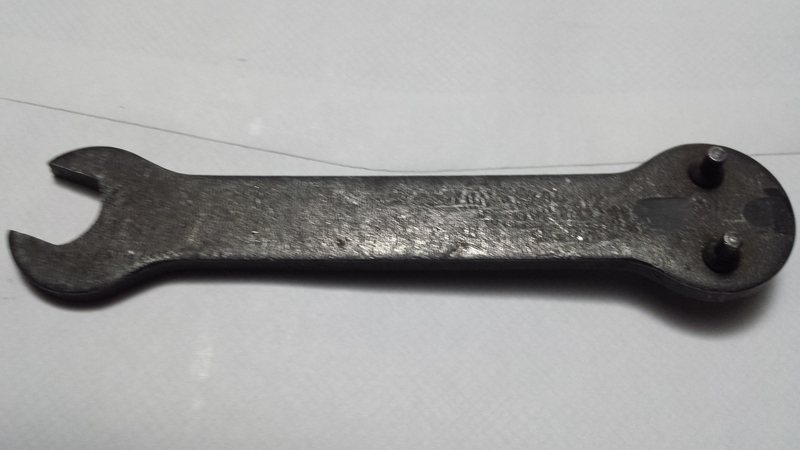 I have a few Norwegian wrenches in very good condition available. 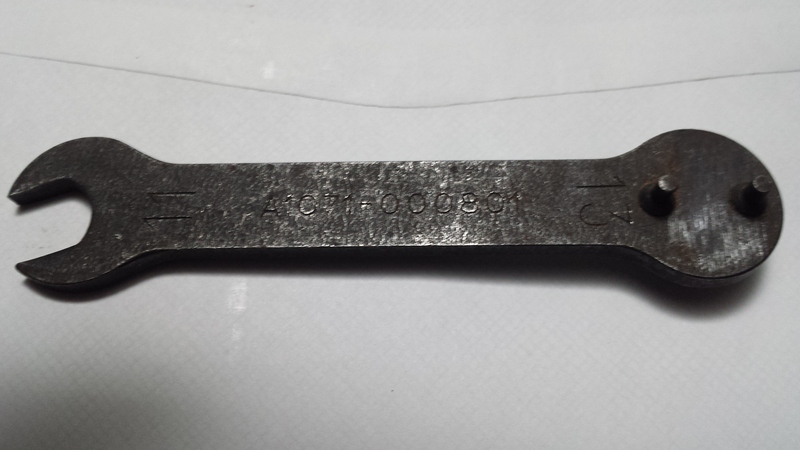 Below are pictures of both sides of the wrench. All are nearly identical in condition. $75 - US first class postage included. The "9,00 konepistooli M/31, most often only tenderly called "Suomi", is one of the best known Finnish weapons of the Second World War. Till today it stands for perfect quality and highest precision, and it taught the Russian invaders the meaning of fear. 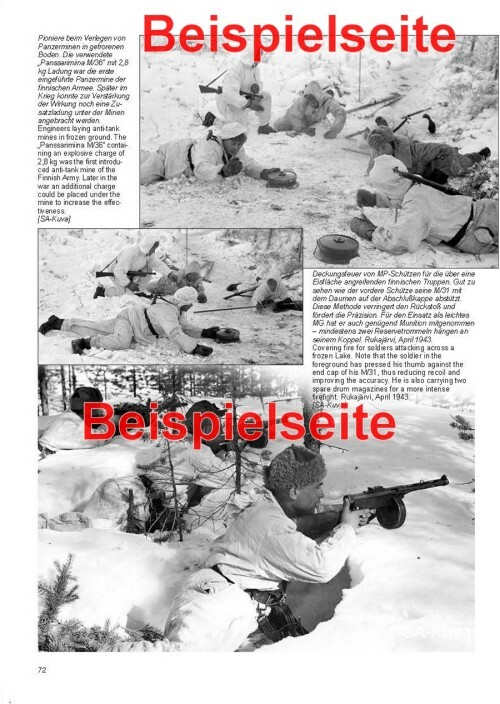 This book will give an insight into the history of this extraordinary weapon, from its development via the manufacturing through to its use in Winter War (1939  1940), Continuation War (1941  1944) and finally in Lapland War (1944  1945). 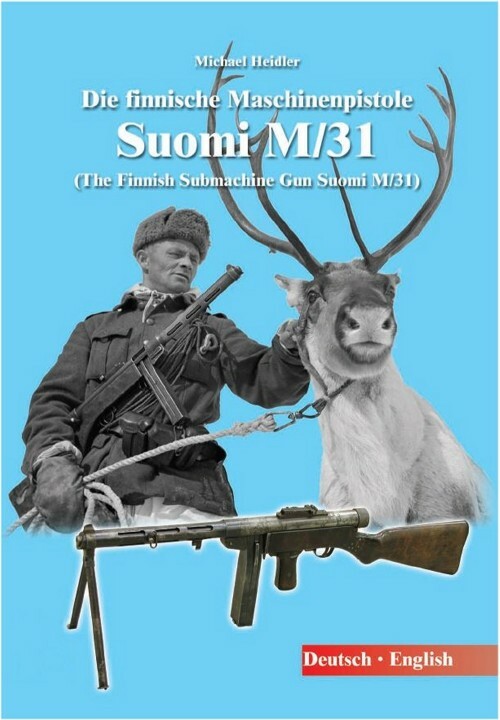 It also describes the lesser known variations like the bunker- and tank-Suomi, the magazines and the accessories. The majority of the wartime photos used in this book were never published before. $50.00 - US priority mail included. of production. Autographed by the author. For questions or if you need more pictures, just ask, but it doesn't get any nicer than this. $235, includes priority mail. 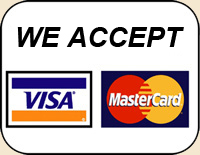 Foreign orders are welcome, registered mail or insurance are required. same order are $6 each (no extra postage charge). 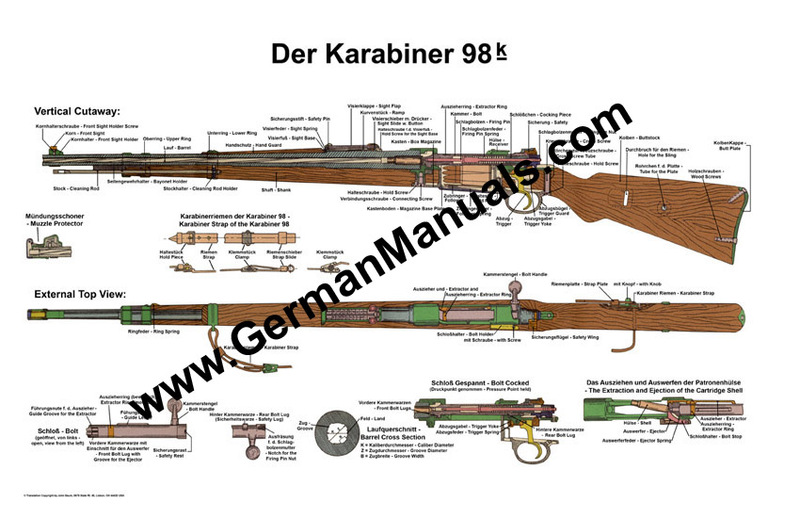 98k Karabiner - The 98k Carbine. Color laser printed on heavy paper. 11" x 17" as shown, in full color at high resolution. 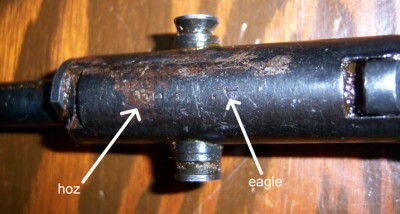 a mailing tube. Add a Sieg um Jeden Preis (above) for only $6. mailing tube, or if you order several posters, they will be sent flat in a heavy cardboard box. Truppenführung H.Dv. 300/1 - Troop Command - On the German Art of War. H.Dv. 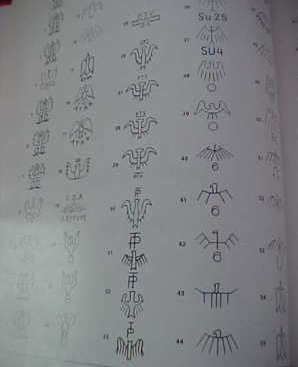 300/1 is the philosophy and doctrine of the German Army in a book. 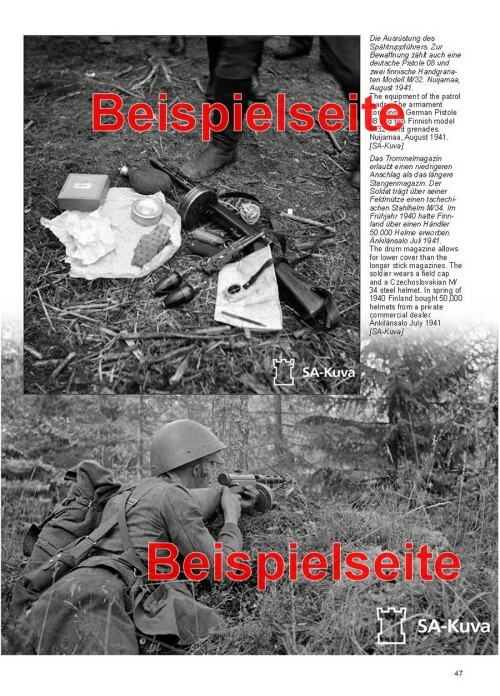 Absolutely worth the read if you're serious about learning the details of the German way of how to conduct and command the German armed forces in WWII. This book was translated and published in 2001 by Condell and Zabecki.. I don't sell it, but found my copy on eBay. It is also for sale on Amazon. This is one that I thought of translating myself, but someone else already did, and did a good job of it, too. 6" x 9", 300 pages. I highly recommend it. I do not sell it, I only recommend it. 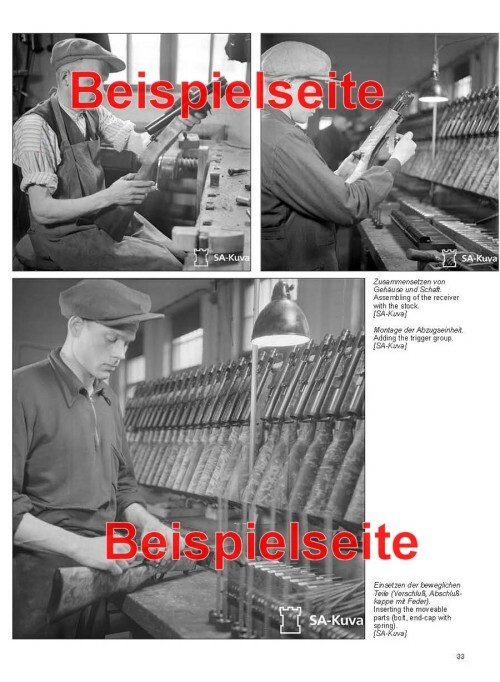 German Manufacturing Codes to 1945 - This book was written by Michael Heidler. Please contact him directly if you're interested in his book. I do not sell it, I only recommend it. finished. Some days ago I got the first package from the print shop. SS-equipment). The official list with letter codes end with "ozz", but I was able to add three pages of later codes. 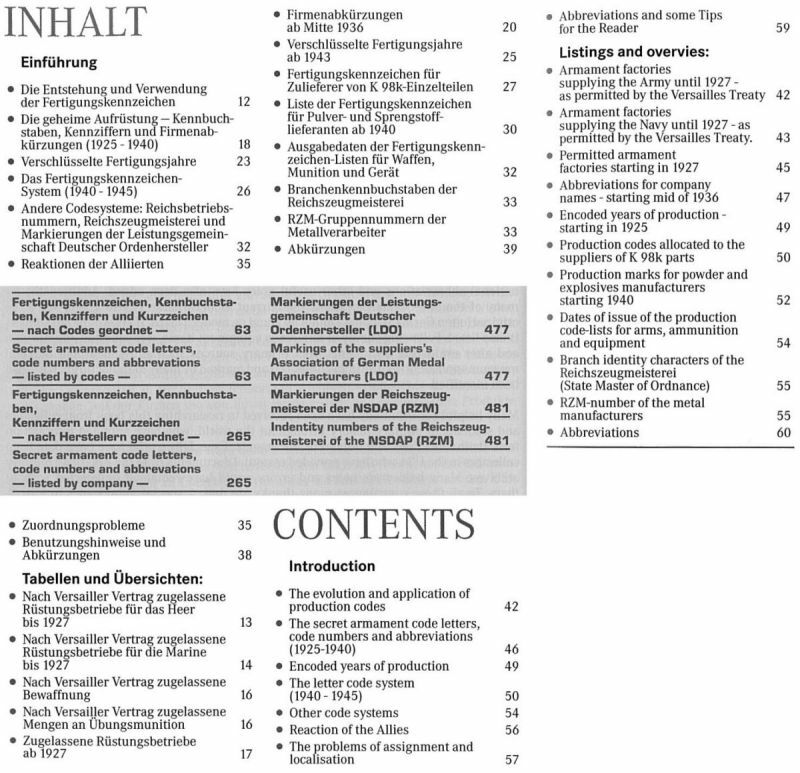 And the best fact: The foreword and the text is written in German and English! found many original documents in archives to reproduce the way of the development step by step. If someone is interested, the price is 35,- EUR in Europe incl. postage. To the US, Canada, Australia, New Zealand and Japan it's 60 USD for a single book by airmail incl. postage. I have attached some pics! If you've already bought Michael's book, here is the list of Updates and Corrections to it. translating the manuals I've done. Use the link below to see where to buy this book. I consider this book a must have for those with any interest in this era. 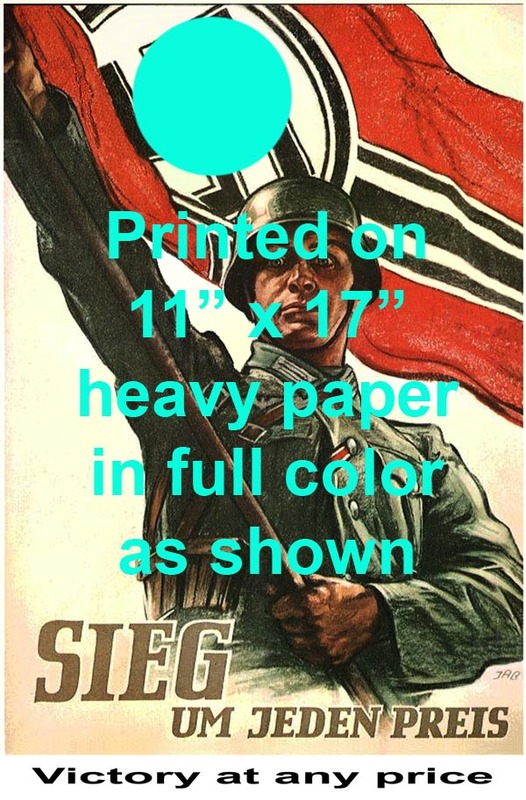 8.5" w X 11"h soft cover. 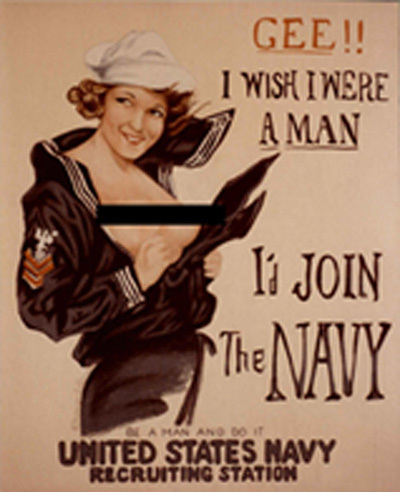 Click Here to see the Orders page.